An evening of good company, and a way of meeting someone new outside my normal social circle that enjoys the theatre and the arts. Max was approachable, friendly and made me feel at ease. What did you drink in The Cut Bar and was it a good place for pre-theatre mingling? A G & T to calm my blind date nerves. The bar had a nice buzz about it and a relaxed atmosphere for a date. What did you talk about before the show? His job, which is fascinating, where we grew up and that someone he went to LAMDA with was in the play (a small world). My job, and how I (try to) balance my social life and theatre/gig going schedule. Pushing ourselves outside of our comfort zones. I was 5 minutes late due to a Citymapper fail (map reading is not my strong point). Sorry! Oh and we almost forgot to take the selfie. Describe him in 3 words. What did you think of #YVDream and was it a good date night play? I’d thoroughly recommend it as a date night play, the humour and muddy mayhem worked well. Rate the date using as many emojis as you like. As theatre companions, we had lots to talk about and he’d been to some interesting productions I haven’t seen yet. Tonic water, great place to meet- atmosphere, music, lively people, good vibe. Our interests/work and theatre/shows we’d seen before. I don’t feel awkwardness on dates, it’s a waste of time. Describe her in 3 words. Very good date night play- for Shakespeare fans, which we were. Max and Alice met at The Cut Bar & Restaurant before watching A Midsummer Night’s Dream, running at the Young Vic until 1 April. Find our more about the show here, or let us know if you want us to carry on with #YVBlindDate and would apply yourself: marketing@youngvic.org. An interesting person, a good laugh, and some good theatre. Positive, felt quite at ease. Neither of us ran away, so that was good. We both went for wine, white for me. The Cut is great pre-show – lively, buzzing atmosphere. Mainly acting – we’re both actors, figures! Describe him/her in 3 words. Definitely the darkest, dirtiest Dream I’ve seen. Good for discussion, probably not for romance. Did you stay on after the show to discuss? We did indeed, over a Midsummer-themed cocktail. Got a bit distracted by Ben Whishaw at the bar at one point. If you could change one thing about the date, what would it be? Nothing really, had a great time overall. Sure, he made a great theatre buddy. She seemed pretty chilled at meeting a random stranger! Also lovely eyes. I had a glass of Cabernet Sauvignon and she had a glass of white. There’s a great atmosphere to the place whilst also feeling cozy and intimate, kudos to whoever designed the warm low lighting. As we’re both actors conversation inevitably circled towards that. The difficulties of the Edinburgh fringe. Post- drama school life. Conversation flowed pretty easy but I did feel embarrassed after catching sight of my terrible red wine lips in the bathroom mirror. I enjoyed the bold choices that were made but it is a very dark version of the play that doesn’t leave you optimistic about love and romance so maybe not! On the other hand all the mud on stage leaves you feeling a bit dirty so there is that…. Yes, we grabbed a couple of cocktails in the bar upstairs. I’d recommend the Peckham Pelican. Would have chosen white instead of red wine. She’s the first person I’ve met whose even a more avid theatre goer than me. Would definitely meet again for theatre trips and speculating on how much washing the stage manager has to do. Zoe and Dan met at The Cut Bar & Restaurant before watching A Midsummer Night’s Dream, running at the Young Vic until 1 April. Find our more about the show here, or let us know if you want us to carry on with #YVBlindDate and would apply yourself: marketing@youngvic.org. 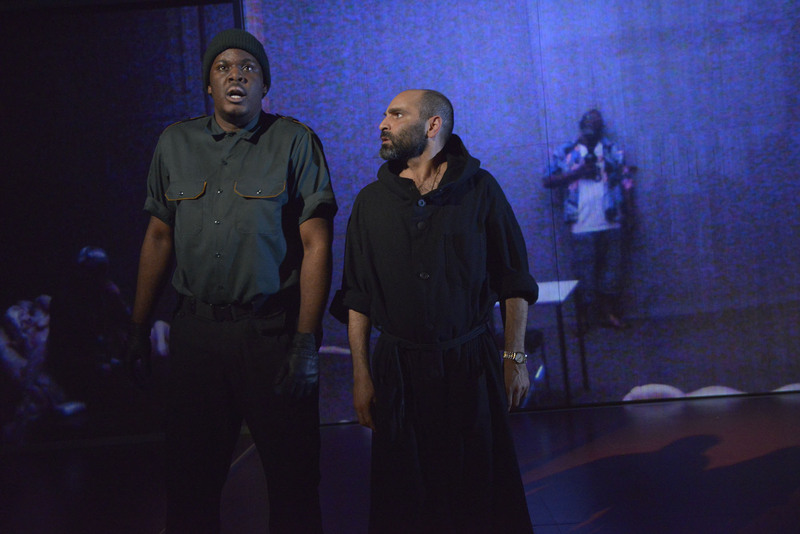 Hammed Animashaun (left) in Measure for Measure at the Young Vic. Photo by Keith Pattison. Can you describe your character in Measure for Measure in three words? Dancing! Or playing games on my phone. One Man, Two Guvnors starring Tom Edden who is in the show. HA! Chicago because it feels like home. 1920s New York because of the fashion. Teleportation. I’d never have to pay for a plane ticket or train tickets or bus pass ever again! Measure for Measure runs at the YV until 14 Nov. Book tickets and find out more on our website. This week Two Boroughs participants have been given the chance to explore different approaches to putting on Shakespeare, from text to clown to design. The workshops have been led by five different practitioners including Jerwood Assistant Director, Jasmine Woodcock-Stewart (Assistant Director for our current main house show, Measure for Measure) and our associate director and Genesis Fellow, Gbolahan Obisesan. 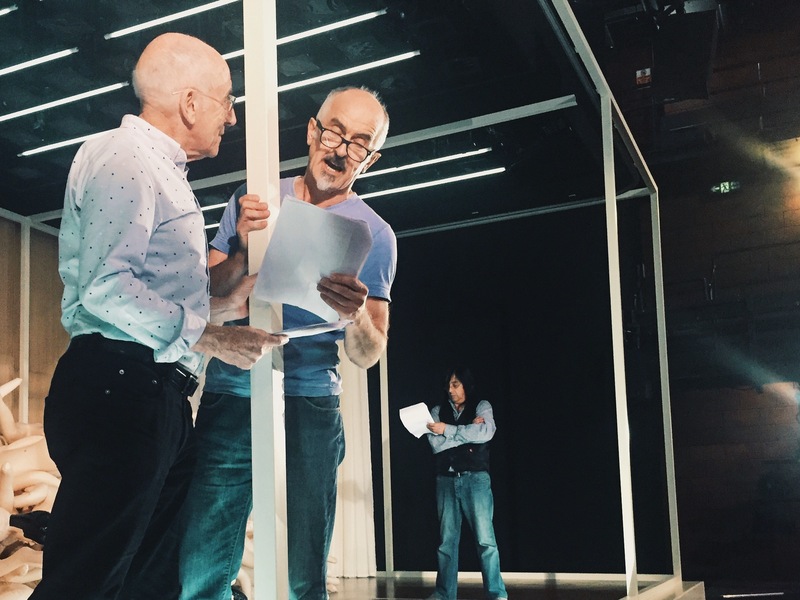 Our participants had the chance to rehearse the opening scene from our Measure for Measure production on the stage, as well as get to grips with the stage management, sound, lighting and video elements to the show. Participants have been drawn from across our members and include people who have been in past community shows including Flashes, The Events, The Trial, Turning a Little Further and The Brolly Project, as well as people who have never taken part in a workshops at the Young Vic before. Find out more about Taking Part and follow @YVTakingPart for all the latest Schools, Young People and Two Boroughs activities, including our Cut Cart story collecting day.